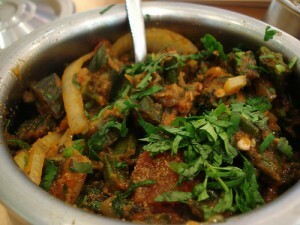 Bhindi Gosht recipe by Nazia at DesiRecipes.com. Wanna have meat and veggie at the same time? Try this simple yet delicious recipe of Bhindi gosht. Its different!!!! Meanwhile wash Okra under running water, dry with tea cloth or just spread in a tray for some time. Now cut Okra by removing head and tail in to half inch slices. In a large pan heat oil over high heat, add onions and fry until change color and edges turn light brown. Remove onion from oil and keep aside. Fry Okra in the same oil until it changes its color and edges start getting brown. Remove Okra from oil and discard oil. Put Okra , onions and green chilli into hot bhuna meat. Stir with care, cover the pan and cook for about 10 minutes over low heat. this is a wicked recipe .. but needs to be given the correct credit! cooking with bj!